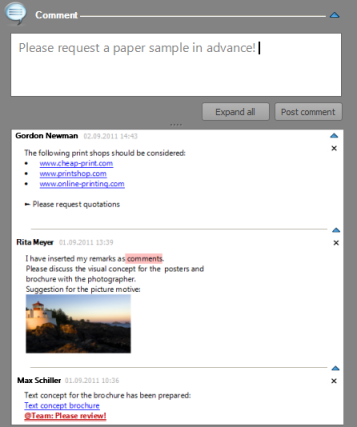 On the Management page, you can now exchange comments on the project as formatted text, link or image with other team members. In the comment history, you can track the exchange of information. For more detailed information on how to use the comment feature, please see Create and change comments. 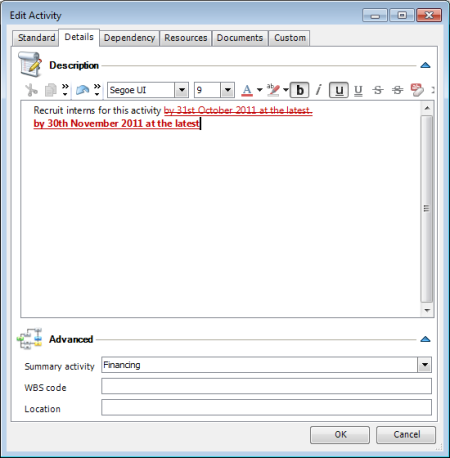 Use in InLoox PM 7 text formatting, images, hyperlinks, colors and symbols to concisely convey additional information about activities, time tracking entries, budgets and documents. Double-click the respective element in InLoox PM and select the Details tab in the dialog box. There, you can enter notes and format them as you like. New communication features in InLoox PM 7 • Copyright 1999-2019 © InLoox, Inc. All rights reserved.